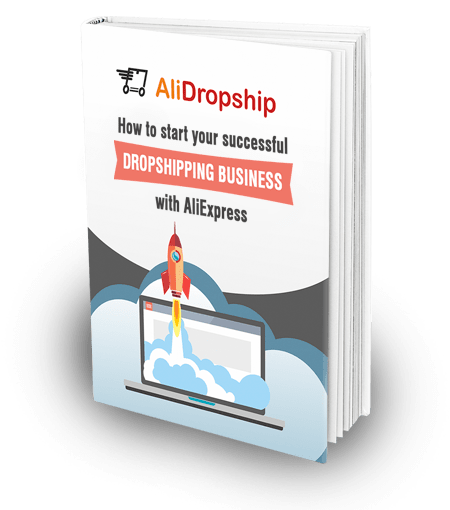 Wherever you live and run your dropshipping business, it’s important to receive your hard-earned profits promptly and conveniently. For the purpose of dropshipping, Stripe is one of the best payment processing systems that lets you get your money with no hassle. However, it’s only supported in several countries on the globe. So, today, we will learn how to register your company in the USA (regardless of your actual location!) to get your dropshipping income through Stripe. How can your dropshipping store visitors pay for their orders? If you target some specific geographic region, you can also use some local payment systems that work on this separate territory. But if you are not limited with a certain region and want to target customers all over the globe, it is best to use both credit card and PayPal payment systems. As to our own dropshipping experience, nearly 50% of our buyers pay for their orders via credit cards. If your dropshipping store doesn’t accept payments made through credit cards, you lose up to 50% of your potential profit. What is more, there are countries where PayPal payments are not available at all! It means that credit cards payment is the only possible option for people on these territories. It means that you must do your best to integrate a credit card payment system into your dropshipping store if you want to work with your customers all over the globe without any troubles. There are various solutions that can be used in your online store for processing credit card payments. But their functionality varies a lot for different countries. For example, we know that there are countries where local laws oblige store owners to show the total bill on checkout page in local currency only. It seriously limits the choice of suitable credit card processors. This is why for our own dropshipping stores, we decided to work with some of the payment processing companies from abroad. If you use these systems, for example, Authorize, 2checkout, Stripe, etc., your store gets an option of taking credit card payments, which is great both for you and for your customers. Still, these systems are also tricky. For example, there is a system called 2checkout. Anyone from anywhere on the globe can register in it, even a private individual without an officially established company. But 2checkout has some really strict regulations. The company staff looks into your store in detail, and pays attention to EVERYTHING. Are you trying to sell branded items? Does the contact information match the contact details you provided upon registering? Does your business niche have a high risk of refunds? These and many other issues are carefully viewed, and your application can easily be denied.At first, 2checkout didn’t even accept registration applications from dropshipping stores as the company didn’t trust them enough. Now the situation is a bit different – 2checkout is more tolerant to dropshipping business. 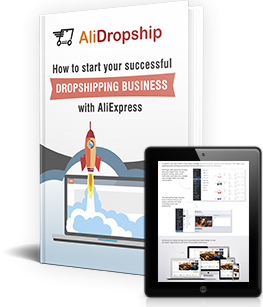 In the end of 2016, they made a statement they are now supporting AliExpress dropshipping stores. You can get cash payments much sooner. Stripe is a very popular and advanced technical solution. It is a payment processing system that lets you accept credit cards on your sites. Using Stripe, you can allow your buyers place an order and make a payment via a credit card directly on your website. They are not transferred to any other websites, so they quickly and easily make an on-site payment. It doesn’t matter what is the country where your customers live. Stripe views your application automatically, so the registration process is much simpler than with 2checkout. They don’t ask you any additional questions, so you will definitely get your registration. The problem, again, is the country where you are based and where your bank account is registered. Unfortunately, Stripe is currently not supported in most of the countries and is only available in the USA and a number of other countries. So, if you are not a resident of one of these countries and do not have a local bank account, technically you can’t use Stripe service. But even if you live outside this region and Stripe does not provide its services in your country, there’s still a way out. You can register dropshipping business in any of the countries where Stripe works, and get an access to it. We decided we will register our business in the USA because it’s much easier than in other countries supported by Stripe. You use a credit card from Payoneer to pick up your money from any ATM. Connect your USA bank account to Stripe. So let’s go through the details! First of all, let’s think of the corporate structure for the business you’ll register. Choosing among different business entities in the US, the LLC (Limited Liability Company) seems the most convenient one and it is easy to start up. It has no corporate taxes and no limitations on who may be involved, and it can be managed by its members or by managers. Besides, it is well-suited for companies with a single owner. Registering LLC is a rather simple process. You can find many companies which offer such service (we can recommend myusacorporation.com and myllc.com). You don’t need to present any documents – just submit your corporate information online. You also don’t need to travel to the USA to register a company. All filings can be done remotely, electronically. What is also important, as a foreigner, you are not required to have Social Security Number to open your company and obtain EIN (company tax ID). You also don’t need to have a US address or phone number, however if you like it’s possible to obtain them from specializing vendors (around $250 per year). All the process usually takes around 3 weeks and will cost you around $400-1000 depending on the US state you register in, and on other additional options you will choose (for example, creating virtual mailing address, etc.). Please be careful – there are states where you must pay very high taxes on your business! We didn’t know it at first, and registered our company in California. Later we learned that in California you must pay at least $800 per year as a business tax, and also really high California state taxes. Not that good, right? Take some time to research USA state taxes, and choose the state with the lowest taxes. Please note that these laws may change from time to time. At the moment of writing this article, we know that in Nevada and South Dakota there are no state and business taxes at all. Once your LLC is registered and you got your company EIN (company tax ID), it’s time to proceed with Stripe account. As soon as your company is registered, your business receives a tax ID. Using this ID, you can register in Stripe. Simply visit Stripe.com and register your account. After it is registered, you need to activate it by filling an account application. Enter your US company details (including EIN), your personal details, and a digital copy of your ID. In a few days you should be approved. Now you can use Stripe gateway on your store and accept credit/debit card payments from your customers! All payments come directly to your Stripe account and you can easily withdraw funds to your US bank account. Stop! How will you get a US bank account? After 9/11 and with the passing of the Patriot Act it became really hard for foreigners to open U.S. bank accounts. Only a trip to the US would present you with the best opportunity to open a bank account. But we have a solution for you! In most cases what you need is not a bank account, but the functions provided by a traditional bank account. For this purpose, you can use a reloadable prepaid debit card from companies like Payoneer. What you get is an internationally recognized debit card and a virtual Bank of America account with routing and ABA numbers that you can easily connect to your Stripe account and withdraw funds directly to your debit card. All you need to do is register with Payoneer.com and connect Global Payment Service to your Payoneer account in order to get a virtual US bank account. As soon as you have connected Global Payment Service to your Payoneer account, you can use this private account to take some necessary data. Then, you need to access your Stripe account, and go to the Payouts section. In this section, you need the Settings tab – here you add your Payoneer account number. Now the money you get will be transferred to your Payoneer account. When you register in Payoneer, the company sends you an internationally recognized debit card through ordinary mail. So you take that plastic card, go to any cash terminal, and FINALLY – you’re holding the cash in your hands! So after all, you have your own limited liability company registered in the USA. It doesn’t cost that much: for our first US company, we paid $634 for LLC registration, and $299 for the USA business and mailing address. It doesn’t take long: in our case, all the procedures took about a month. Your business is now fully legal. It’s registered in a real place in a real country, it has a tax ID, and all that. You now have a company in the USA! How cool is that? You have a virtual account where all the money from your buyers is stored. It’s convenient to use and easy to understand. You can rightfully use a convenient payment system. You can transform all the money into real cash, and use it the way you want. We hope all this information will be useful to everyone wants to register their business in the USA. As you can see, registering your dropshipping company in the United States is not that difficult. Instead, it lets you get a lot of legal advantages, and also deal with money easily. If you have any questions, notes, or your own tips – please leave them in the comments section below! We are always happy to receive your feedback because it lets us make our guides and articles even more helpful and useful. On opening the payoneer bank account, do you open personal bank account or business bank account? Thanks for sharing! Is it possible to use stripe as an individual without have to register a business? As far as I know you need to have a company registered . I registered with stripe a few years back as an individual. I am in the UK it was for a gofundme fundraising page. I still have it and I logged into it the other day although I have not had the need to use it recently. What are the tax filling requirements if you have a US company? Who handles the tax requirements of the LLC company if you live outside the US? We are preparing monthly income reports and expenses. And you need to complete tax declaration each year. Taxes and requirements depend on a state you established a company in. I hired a CPA who helps me with tax filling and tax returns. Could you elaborate on the process of hiring a CPA? Where to look for them and requirements…Thank you! Also, if you register an LLC, are there still gonna be issues opening an account in the American bank? Just search for companies or individuals who provide CPA services, read reviews, contact, learn about the conditions and requirements. if you want to open a US bank account for your US LLC you need to fly to the USA. If you don’t have such possibility you can use Payoneer account with your US LLC. I am not sure about sharing information between countries. I have a friend who helped me register for stripe in the US with his details, I was wondering though if I need to access my stripe account using a VPN or something to avoid being banned. Thanks for the comprehensive information! One question though, how do you file and pay income tax for your business? I recommend using Quickbooks to file your income stats and expenses. Then you need to pay taxes each year. Absolutely, you don’t need a US company to accept payments from American citizens. Just faced this problem today when I got rejected by 2Checkout. It seems they don’t like dealing with drop shipping business at all. 1) Doesn’t Stripe ask what you are going to sell, wholesale/drop shipping agreements? Aren’t they going to look at what you are going to sell? 2) How do you avoid the limit Payoneer on 9 transactions a day? If you drop ship successfully, there will be much more orders. BTW, what about registering a company under another company? It’s even cheaper. Should I use US proxy when I’m applying for Stripe? 1. Stripe also checks what you are selling but it does not ask for any agreements. 2. Actually, we have not come across with such issues. 3. As far as I know PayPal does not work with Payoneer. What are the additional charges for LLC? (Monthly, annual and accounting)? Is it necessary to make a tax return? You need to pay taxes once a year. And you can also make a tax return. The requirements and amounts depend much on a state you register your company in. So when your customer makes a purchase with Stripe the payment goes directly into your Payoneer account? When a customer makes a purchase, the payment goes directly to your Stripe account. Then you withdraw money from your Stripe account to your Payoneer account. Actually, this is a good review. But there are certain things you will need to amend or review and update so that it will be a complete guide for people who wish to open a company in US. d) Stripe does not support drop-shipping business. This is the feedback I got from Stripe. You need to state how to overcome that as Stripe considers it as high risk since the account holder does not have any control over the stocks!!! f) Even if there are 0% income tax, there are statutory filings with state which is very important. Need to know these things with a CPA. Hence, it is vital that you know them. I think this is a good article and very informative. I would like to suggest that if you can address the following concerns also and incorporate them to the original doc, then one shot the readers will be able to educate themselves. What’s the point to talk about it if Stripe actually works fine with dropshippers? :) If you applied and your application was declined because of dropshipping, let’s talk about it. Yes, let’s talk about it! When Opening the Stripe account I decided not to lie and tell them my business model. They declined my account as it is high risk business to them.. I had nothing brander, nothing high risk, but I didn’t have my own stock. It clearly says in their T&C. I opened Stripe under other business, but I never know when I’ll get suspended. ALSO, Stripe does not accept virtual bank accounts. AND Payoneer DOE NOT accept payments from your own accounts. So I really don’t understand why all gurus talking about Payoneer + Stripe. Maybe it only works because somehow they have’t noticed yet. In this case it is walking on thin ice! But why to make payoneer acc, and to move my money there, when stripe have own stripe debit card and can withdrw the money from where you want ? I have not heard about such option. Yes of course, you can use such service from any other provider. For uk citizen is it necessary to register a company to make stripe account? As far as I know you can register with Stripe as individual if you are UK resident. Please I would like to move/transfer the money from my payoneer account to my local bank account. Is it possible. Yes, there is an option on Payoneer account to connect your local bank account. Hey,can you pls advise about taxes, do you need to pay annual taxes and calculate exact amounts or fulfil any kind of documents?Or you opened LLC is States, you mentioned, without any? Yes, you need to calculate amounts and pay taxes each year. I registered an LLC but the Stripe account application asks for the last 4 digits of your Social Security number. Just enter your EIN last 4 digits instead. Because the SSN number, they require me to update my passport or identification to verify? I really appreciate your work, your professionalism! Can we use one account (LLC+stripe+Payoneer) for multiple webiste or domain? You need to register a new account for each site, but it’s not a problem, you just use the same LLC details. What if i find a friend or relative of mine and he registers on my behalf on stripe as a Canadian for example, will it work? I didn’t understand how to do it. Great article. However, you CAN’T receive payments with Payoneer. You need a local US bank. Can you please tell more about taxes? Some people say that as a non US resident, I need to pay taxes only in my country. Or you just fill the 1099 form? You can receive money with Payoneer. 5. Withdraw money from your Payoneer card from any ATM in your country or transfer money from Payoneer to your local bank account. As for taxes questions we will publish an article soon. Payment Gateways and tax is the worst part about dropshipping as non resident. Hello everyone and thanks for your wonderful Blog Yaros concerning this matter. I found an interesting article that affects all Non-U.S. residents that set up a LLC company in the U.S. (Delaware, Wyoming or Nevada) and sell in the U.S.
Actually there is a problem related to linking Stripe with Payoneer.. when a customer asks for a refund you cannot give him back his money once it’s transfered to your Payoneer account and this will lead to some issues with Stripe that you don’t want! I have never had any issues with it, I always have some money on my Stripe account to give refunds. Just wondering whether one business registration is for one niche? Or is it possible to register an umbrella type business (with a more generic name), that could cover a possible range of niches? So multiple income streams could flow into a Stripe (or other) account. Is this possible? For example, My Pet Biz could cover incomes from mydog.com, mycat.com and myrabbit.com. Yes, that’s the right idea I think! Choose a more generic name and all your dogs, cats and rabbits can use the same umbrella. If I create a Stripe account via a US friend registers as an Individual/Proprietorship, does he still need to pay taxes? Also when connecting that account to a Payoneer account, is it possible to connect a Payoneer account the created in someone else’s name? Yes, you can connect other Payoneer account, but taxes are paid by a person an account registered for. am i still need to have a physical address or phone number? 2) if i run 2 stores, is it enough to have only 1 LLC ? can i use same stripe account ? 3) if stripe request ” US resident document” for verification purposes, how can i go through with it? 1. It is better to register a virtual address to get necessary documents. It costs $100-200 per year. 2. Yes, you can run any number of stores under one single LLC. 3. When you register Stripe through your US LLC, you will only need to provide your company EIN and address (virtual). can you tell where i can get those virual address and other documents please? when i registering for stripe, am i used my real living address or usa based address? If you are registered as US business, you need a US address. What about US taxes? There seem to be so many, that I don’t see how registering a company there is worth it. You can just use the payoneer account with no business there, and register it elsewhere. If you are based in the country that is not supported by Stripe, you can’t create a personal account. Yaros, thank you for this detailed post. It is really helpful to us. I got a couple of questions. 1 – When applying for stripe and using stripe do we use a US Ip of the State where the llc is registered? 2 – When stripe asks for ID docs or verification. What do we do then because they would know that we’re not US citizens. I would really appreciate if you could answer these two questions. 1 – you don’t need to use US IP, you can register from your country. 2 – you provide your real documents, it does not matter from what country you are when you register Stripe with US LLC. Six states, North Carolina, North Dakota, Colorado, Mississippi, South Carolina, and Utah, have top rates at or below 5 percent. Nevada, Ohio, Texas, and Washington impose gross receipts taxes instead of corporate income taxes. Can i register my llc in wyoming if i reside in GA? Hey, thanks for this info ! Do i need to register personal account in Payoneer or business one ? You need to register a personal one. There is no option to register a business one. Thanks for this very helpful post, Yaros. When signing up for a Stripe account, is it okay to have a non-US address? As far as I know you need a US address. Stripe is not available in my country. What if I want to register the business in Winnipeg, Canada? I’m not physically there. I want to register it under the name of my Aunt or cousin. Is it possible? Hi, i had an Stripe account set up like you explained but now, stripe can’t deposit to my payoneer account and they told me they no longer support payoneer. Hi, Stripe does not support deposits directly to your Payoneer account but it supports deposits to your virtual bank account created on your Payoneer account. Please review the article again paying attention to the Global Payment Service you need to register with your Payoneer account. thank you for this I was struggling to find a solution from months, in my country I can only work with paypal. Now I have a question : can you business adress (used to create your llc) in a different state than the one where you regiter your llc? In my case, I will go for Wyoming, and use a PO Box as business adress, but my PO Box is in Florida, is that a problem? But on Stripe, they are currently asking for Personal Details like last 4 digits of SSN No, while submitting the application ,registering an LLC won’t get us SSN right ? Just set your EIN first numbers instead. Sorry, the LAST 4 EIN numbers. -A Euro bank account in one of the Stripe supported countries-physically located, not virtual. This is the response of support. Your comments on this situation. From our experience, the most convenient and business-friendly states are Wyoming, Delaware and Nevada. They have no state income taxes for the businesses operating outside these states. yaros thanks for the help you are giving to the community,you are awsome.So if I understand you good you can open US stripe account if you are not from the country that stripe supports by incorporating US company and adding Payoneer Global Payment Service US bank account,for SSN you use the last 4 digits of EIN,but what if they request verification of your identity and you are from Croatia? You send them your real identification documents right? I only want to know is this model totally approved and legit by Stripe also.Best regard and thanks in advance. Yes, it is absolutely legit model. Since you don’t have SNN but have a registered US LLC, you can use EIN instead. As I know drop shipping has prohibited by stripe, did you guys have any problem about this? are you still able to use your stripe account? what if stripe understands you are a dropship business? I am, running 20+ dropshipping stores using Stripe and I know at least 100 dropshippers who are using Stripe on their dropshipping sites. No issues. Hey,thanks for great value!On payoneer when applying to Gllobal Payment Service they ask about your source of income/website/describing what are you doing etc.Do you tell them about ecommerce and just link your real website there,or tell them you are freelancer from fiverr,upwork etc? Just describe what you are doing. I’m confused (probably because I am new to payment processing). Can’t we just sign up for PayPal Merchant account to accept credit card? The only problem is: Payonner sometimes assigns a number of a bank account that does not receive Stripe, is there a way for payonner to change it? My friend and I have the same routing number. He opened a stripe account a month before I did. His routing number and a bank account were accepted by Stripe, mine wasn’t. I am not sure what was the problem. Has Stripe changed some of its policies? I live in Canada and am researching the steps I need to take before opening my first online drop-shipping store. Is it necessary for me to go through the process of opening a Stripe account in the U.S. to target the U.S. market or have the convenience of Payoneer payouts…or can I just register my business in Canada? 1. Is it not basically the same thing? 2. 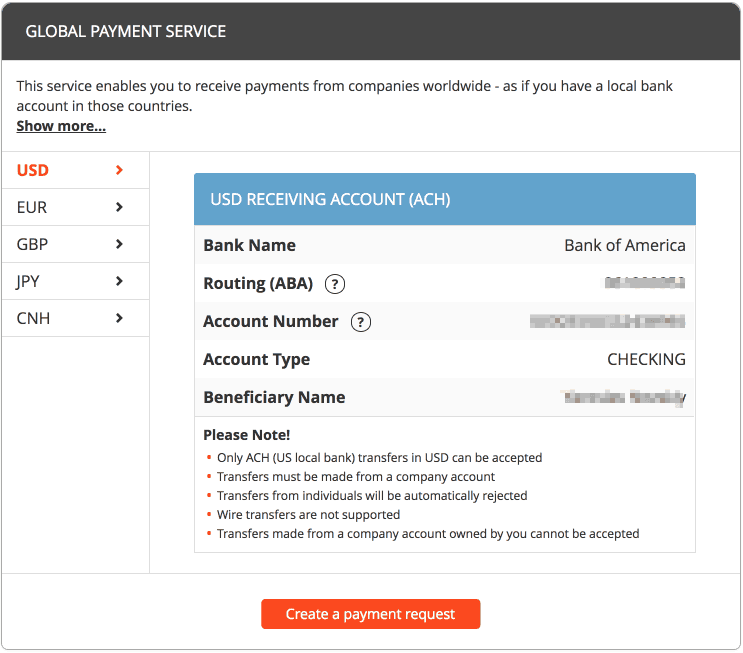 Does Payoneer only work through a U.S. bank account? 3. Are there any disadvantages to registering in Canada instead of the U.S. ? Thank you so much for your feedback!! Hi Daniela, please note Payoneer is not a payment gateway, so you can’t use it directly on your site. I recommend that you register Stripe account and use straight away. 1) I was wondering if you or other have experience using “usformation.com”. The problem is they seem too good to be true, in their $399 “kit” they include US bank account, phone, and physical address plus other features. According to the services recommended by Olga (myusacorporation.com); one of their articles said “don’t trust those services who offer to open an US Bank Account, usually they are fraudulent, because the new law after 11S doesn’t allow it”, they recommend payoneer. 2) I was checking the “myusacorporation.com” packages but there are many options there to choose, or is enough with their “Basic Package” as is? 4) Which services do you recommend to Phone Verify Stripe accounts?. 5) Which Physical Address service do you recommend?, is it necesarry to pay for it forever or just 1 or 2 months while stripe verify it? 1. As far as I know there is no possibility to open a US bank account distantly. So, if you decide to work with this company, get to know about it in advance. 2. Basic package is enough, any additional services you can order later if needed. 3. I would recommend Nevada – zero federal and zero state tax. 4. Try GrooVe IP VoIP app for Android. 5. You usually pay once a year. You can take it from myusacorporation.com or any other services offered in Internet. Thanks for the info bro…this is pure gold. Thanks for very informative article. This seems like a solution of payment problems for many non-US online entrepreneurs. However, if you try to sign up with Payoneer as a company, you will be required to provide US bank account details in the last page of the sign up process (the one that’s called “Almost Done”). It does not let you to skip that part. Nor does it let you to change the country once you are signing up as a US company. How to solve that? I have been researching the internet for guidance but found nothing useful. Or shall I sign up as an individual? And use personal bank account from Payoneer for a US company? You need to register a personal Payoneer account and after open a virtual US bank account with Payoneer. 1- there is any restriction to use the money in my country? 2- Do I need to justify it as my LLC’s expenses? 3- Can you share with me your CPA contact to deal with? 1. – there are no any restrictions on using your money in your country. 2. – you can hire workers in your country, pay them from your dropshipping income and add it to your US LLC expenses. Do I have to pay 30% income tax? First of all, pretty well written and very informative article Yaros, way to go! I just have one question at the moment, if I’m not a US citizen and I don’t live in the US either, but I have family living there, can I use their address when signing up on Stripe and avoid paying for the address service? Hey Yaros! What a nice article, congratulations! If a have family living in the us can I use the address of my family house instead of paying for one? Thank you so much for these useful information! I’d like to know please by using Stripe as a gateway and linking it to Payoneer, how many days does it take to be able to use Payoneer to pay online or to withdraw from an ATM? In other words, how many days does it take to have the money from Stripe to Payoneer? Should I file my tax returns my country or USA LLC that I am using to register stripe? Yes, you need to file your tax return with IRS (US Internal Revenue Service). I would also recommend that you get ITIN in US to get max return on tax. Does this still work in 2018? I heard people saying Stripe does not support Payoneer and are banning accounts who are using it, which doesn’t make sense because we are LEGALLY registering a business in US and paying our taxes regularly. Can anyone please confirm this? I really want to try this. What happens if someone claims a refund? There’s no reverse payment in Payoneer, we can’t actually refund a transaction in Payoneer. Great info. But how do you do Stripe’s sms verification? US Numbers from Sonetel do not support verification messages. Try GrooVe IP for Android, it works fine and it is free. Thank you so much Yaroslav! Nice Article SOme Clarification needed. First, it is stated that as a foreigner, you are not required to have Social Security Number to open your company and obtain EIN (company tax ID). There after when Opening Stripe, You inform that to register as LLC and enter EIN. Both seems contradictory. Let me come to my point. Im from India, and Plan to do Drop shipping. I need stripe. 1. When Registering Stripe I should give my address as US address or Indian Address ? 3. As you first mentioned, foriginers dont need EIN. then how I register with Stripe ? You need to register US LLC and obtain your EIN. Then you register with Stripe providing your company name, US address and EIN. If you have all documents from the LLC you should have a form that includes your US address that you provide during registration. You can send this document to Stripe. How can I receive payment for dropshipping site from Indian customers debit or credit card in India. Can I dropship through AliExpress to the US whilst being (business) based in the UK? Or do i necessarily have to start another company in the US. Will I have to pay taxes in the US even though i am already paying in the UK? Yes you can, you will not need to pay US taxes at all. I used myLLC, I paid $474. There is working a group of women. They are very attentive and honest about I should have to buy. MyUSACorporation tried to catch me $1200! In April, 11, I payd for LLC in Wyomy (free tax state and lower anual state renew) and EIN. I paid at night, and in the next day, near 13 hour in Wyomy I received by email may LLC registration. In April, 17 I received here in Brazil the articles (documents) printed posted by Fedex. Today, April 19, I received by email a fax image of my EIN. I have just submit my strip account. I could use immediately. Thank for all tips in this article. 1. May I ask you, is this sheme still working on your side? 2. It seems that Payoneer gives virtual bank accounts randomly, I got First Century Bank, not Bank of America. Does it make any difference? Please share your experience here. 3. Maybe you have an idea, can other person open US bank account (being in US) on my behalf, having all my LLC document, EIN and notarized power of attorney? Maybe you did it or heard about such case? Thank you in advance for any details! 2. There is no any difference. 3. Unfortunately, it is not possible. If you register a company in US, you can also open a PayPal account, even if it is not supported in your country. Please If I want to get a US Address, Phone Number and Social Security Number as a foreigner, how much will it cost me and where can I obtain them? I hope to hear from you soon. there are tons of services on Internet that offer a virtual US address and phone, it will cost around $100 per year. As for SSN you will not able to get it if you are not a US resident or have a working US visa. Just wondering – Do I need stripe for accept credit cards ? I can do it with Paypal it self. Is it true that you better use skype Numbers and avoid free US number services because Stripe will detect it and deactivate your account? I’ve read this on another blog. I am not sure about US number services, but Skype number works fine with Stripe. Hi Yaroslav, I have one concern. I will use my Payoneer card for making orders on Aliexpress. But the card has its limitations to 9 transactions per day and 2500$ of total spending. What if I will get more orders for more than 2500$? How can I increase my Payoneer card limitations? I’m also gonna use my Payoneer card for making orders on Aliexpress, but as will wrote, it has its limitations. I am not sure about sales tax in Alabama, but you need to pay income tax anyway, in any US state. I have registered my LLC in Wyoming and I got the EIN number, but on the Stripe, they ask you also for your home address. Should I enter my actual address? I am afraid that if I put my home address in Poland they can reject me. Hello, i didn’t understand very well, how do i receive the debit card trough mail? I have got a virtual address in US. Can I enter it (as a sole proprietor) at my home address details in the activation page of my Stripe account? Yes, you can, it will work. it is neccesary to register our company in US LLC ? if i take payment through paypal not stripe …..
i don;t want to pay 400-600$ for registering to company to us llc . It is not necessary to create LLC in the USA to use PayPal. Thanks for this details, please I would like to know if it is possible to use a business already registered by family in the US to register with stripe and when filling personal information whose details would be there, mine or my relative? Hello, what do you mean by registering by family? Does it mean that the company has several owners? Then state the one who is the general manager. Stripe supports dropshipping sites, most of stores use this gateway including all Shopify stores. I registered my company from Delaware and I bought a virtual mailing address in Nevada for my business when I registered my company from delaware, I provided my virtual mailing address in there as well. I forgot to renew my virtual mailing address subscription and now I have lost that address. My question is, is it necessary for me to have a mailing address? Will it cause any problem once I have to pay my taxes every year? Payoneer is not alternative to Stripe. They can only be used together, since Payoneer is NOT a payment gateway and you CAN’T connect it to your site to accept payments directly from your clients. Payoneer is only needed to withdraw funds from Stripe. Only problem is Payoneer no longer exist..so part of this article is defunct. I have a question, does this method still work? This article was written in April and I have found similar resources on the web, and one of them was saying that this method does not work, it was written in Jun. They were saying that stripe has more advanced process to get a complete stripe account. So, now it’s October and I haven’t found any recent updates on this topic, so I still don’t know, does this method work? So how do you pay to suppliers? I know that you can’t pay with Payoneer, their account can only accept money and withdraw through their debit cards (by the way they’ll send you a debit card only when your account reaches USD30, not upon your registration). Also, it would be great if you could elaborate on how to handle the US taxes (just pick say Delaware or Nevada) and go through the process of hiring an accountant there, costs efc. I think that’s the crucial part. If you have Stripe registered in Australia and linked to Australian bank account, can Australian Stripe still link their account to Payoneer one (American account)? Are Payoneer’s American virtual accounts part of global financial exchange system (that was just introduced)? Thanks mate! Well I was in Australia and just moved to Russia, so I guess I can use my Australian bank for a while. Will have to change it later to Payoneer and go through registering an LLC. Could you guys issue a step-by-step article about dealing with the US taxes, hiring CPA, where to find them etc? So any knowledge on Payoneer’s participation in global financial exchange? “Since SSN (Social Security Number) is only issued to U.S. citizens, permanent residents, and temporary (working) residents by the United States Social Security Administration, it is impossible for foreigners to get it. Call the IRS — phone number (800) 829-4933 — and tell them you need an EIN. They will insist you to send the form by fax, but there is a workaround for this. Just say that you do not have a fax machine and would like to do it by phone. The operator will ask you to have the form on hand and read out the fields. So it seems that the guy just gets EIN by calling to IRS. No need to open LLC. Yaroslav, what do you think? Thank you for sharing! I can confirm that this method can also work for the people who are not interested in having an own US LLC and just need to obtain EIN and register Stripe. Kolya, doesn’t Stripe require LLC? I’m not sure EIN is sufficient. As far as I know they have a list of eligible countries. Russia for example is not there. I’m interested in the whole process of registering LLC and especially hiring an accountant, CPA. Are you sure about using virtual address with Stripe because that they accept only real bank, and what if they found out that you use Payoneer, or if they ask you for a bank statement for example??? Stripe accepts and works fine with Payoneer. Hello, as I can see Shopify does not use support Stripe anymore. 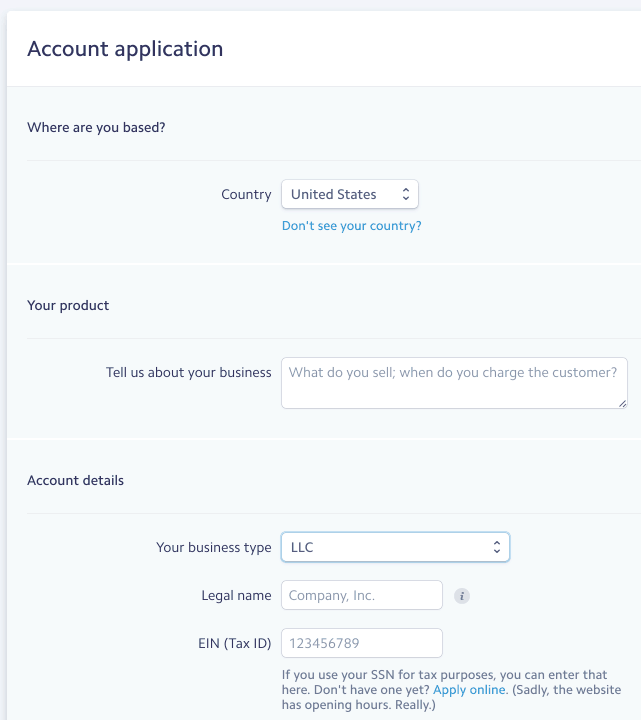 You don’t have the option in Shopify to configure Stripe as a payment provider if you have a company (LLC) based in the U.S. Instead you can only use Shopify Payments which is powered by Stripe. But Shopify Payments does not accept Payoneer accounts, while with Srripe you could use Payoneer accounts. So now I guess it will be very difficult to use Payoneer as a virtual bank account. You need a real bank account in the U.S. So now what can I do to accept credit card payments? Sorry, I have no idea about Shopify, but WordPress+AliDropship+Stripe+Payoneer work great! Hi Yaros, I’ve been reading all the discussion and I have to thank you for all the valuable information I found in this article and all the useful comments about it. I want to embed on my website a credit card payment system and I have tried a couple of Payment Gateways but I got rejected. One company told me that my business model is not supported and the other said that my region is not supported. I live in Greece and I have created an international website about makeup products but I don’t have a company formed. So for now the only way to get payments is via Paypal, but this is not enough. I need to be able to accept credit cards. I still don’t know the real reason that I got rejected but I guess maybe it was the fact that I don’t have a company. So I have a few questions to ask about my options, as this is very important to me and I have spent a lot of time and effort in creating the website. 1. Is it better to create a U.S based company or a European based company? If I create a Greek company the taxes are high (about 26% taxation). I could also create a Bulgarian company (about 10% taxation) or a company in Cyprus (about 12% taxation). The advantages with a U.S based company is that I have access to many more payment methods and gateways and most probably I will get accepted by the providers, but if I create a company in Cyprus or Bulgaria then I will still have to check the available payment methods for these countries and I still don’t know if I will be accepted that easy by the gateway providers. I also don’t know if the providers will like the fact that I am based in Greece and have formed a company in another country. 2. My website is international (.com) so I am planning to sell globally. This is going to happen with paid Ads with Facebook or Google or Instagram shoutouts and I plan to try different countries etc. and see where the ad works the best. So I may or may not target U.S. (I probably will at some point). So as I understand if have a LLC in Nevada and I don’t sell anything to people in Nevada I don’t pay any federal or local taxes? I just have to make the tax filing each year? What is your opinion and which one you think would be the best solution for my problem? Thanks again for the valuable info, look forward to hearing from you. Actually you can sell products to customers in Nevada without any additional local taxes. As for establishing an US LLC, you are right, the main advantage is access to many payment gateways. But if you find a good payment gateway that works with a company from Cyprus for example, then why not to establish your company there. I just wanted to make it clear. After I register an LLC, how do I open an American account? Do I need to fly over to the US or can those registering agents do that for me without my presence? Will my name be open to public anywhere? LLC documents, registrar? Bank account – is it opened on behalf of my name or is it a corporate LLC one without my name on it? Due to recent legislation on global financial exchange information, will that American bank (also Stripe, Payoneer) be sharing info with other countries? I’m not sure it’s viable for business to pay taxes in the US and my country as well. I know you might not know although I’d appreciate your opinion on this. Hello, if you wnat to open a US bank account for your US LLC you need to fly to the USA. If you don’t jave such possibility you can use Payoneer account with your US LLC. I am not sure about sharing information between countries. So Stripe will accept Payoneer’s virtual bank details? Really? If you need to open US bank account you need to visit the USA and apply personally. If you don’t have such a possibility then register Payoneer. Payoneer is not a payment gateway, so you can’t use it directly on your site. While we hate to give you anything less than a great experience, it does seem that your business does not meet our current account requirements—we are currently only able to support accounts based in the countries listed at https://stripe.com/global. Even though we can’t currently help with your business, we very much look forward to helping out when we can. We currently have a dedicated team of people whose primary goal is to bring Stripe to every country around the world, and we can’t wait to get you up and running in the near future! We understand that there may be some work involved with moving your business away from Stripe, and we’re happy to help out with this process by giving you 14 days to switch over to a new provider. After that, you and your connected accounts won’t be able to accept additional charges, but we will continue making payouts to your bank account until you receive all of your funds. We’re very sorry that we have to turn away your business, and we all wish you the very best of luck moving forward—we hope you’ll again consider Stripe once we’re available in RU! Stripe accounts primarily require a local physical address, business registration, local bank account, and significant operations in that country. Your account does not meet all of those requirements and as a result we’re unable to support your business. We recommend creating a Stripe account in your home country as soon as Stripe is available there, but in the meantime we cannot reopen your account. Let me know if you have any questions or concerns about this. I just wanted to share my experience.. So glad that you have shared your bad experience with Stripe, but my question is, now what do you plan to do, meaning which payment system are you going to use for your assuming dropshipping business? Also Yaroslav, you probably used Stripe also, so have you experienced the same thing now ? What do you say about Stripe Atlas? They are offering a form company in Delaware (Stripe Atlas LLC), Open a business bank account, Obtain your Employer Identification Number (EIN), Accept payments with Stripe, Handle your corporate taxes. They are charging $500 once the company is fully set up. We have not never used it, but according to the experience of our clients, it is a good solution. Do they (Stripe Atlas) mean they open regular bank accounts for non US nationals as part of the package? Not sure, I have never used this service. Hi Yaros, I just got my trunkey website. Based in Bermuda. Need to get a credit cards payment gateway. So does the formula WordPress+AliDropship+Stripe+Payoneer still work in 2019?? I read all questions/answers and would like confirmation that Stripe combined to Payoneer is the best gateway solution for my new site without getting rejected from the get go or down the line? I don’t feel like wasting time and money if this is not 100% reliable. But I am ok to invest in a US LLC if this is the only way. Many thanks! Hi, yes, it works absolutely fine! I have a US LLC now. I tried to open a personal Payoneer account yesterday giving my US address, US phone, and US EIN, and Bermuda bank account as it looks like I could not skip the page on their registration site. You need US LLC to register Stripe, NOT Payoneer. to open a Payoneer account use your personal details and apply as individual. Thank you. Just asking. Any way PayPal PRO be integrated in the plugin as credit card gateway? At the ID section, should I upload my personal country ID? Yes, you need to add your personal ID. Hello Yaros and thank you for all the amazing things you made possible during the last years. Related to this article, how do you get money from an LLC? Can you freely use the money from the bank account or there are some other ways to be able to get the money? I am interested first in how you prefer to do it and second if you considered alternatives. Hello, yes you can withdraw money from your bank account without any problems. For those who need help for EIN and Stripe Payment gateway activation, feel free to reach out to me and I will help you with my service. Hi Yaros! Thank you so much for the nice article. I have a delaware LLC and im planning to create a payoneer account soon. Tho Im in australia ATM, and itis okay even if i dont have US LLC because stripe and paypal are supported in australia. The reason why i formed an LLC is because im planning to go back to my home country. stripe is not supported there. that’s fine, I don’t any problem here.